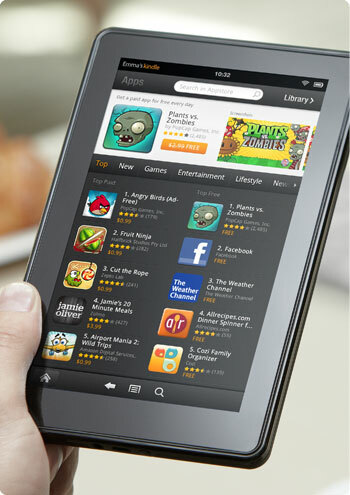 Before the recent launch of Amazon's Kindle Fire, many speculated that the 7-inch tablet could be an iPad killer. But the Kindle Fire clearly targets a different class of individuals: those who mostly consume Amazon content / shop on Amazon and don't care about having access to a diverse app library. While the Amazon app store has some high-profile apps like Netflix, Pandora and Facebook and games like Angry Birds, it lacks a native email client, Spotify, Tweetdeck and Google's suite of apps (Maps, Gmail, etc.). Obviously, those missing apps might matter more to certain people, but it's important to know that the Kindle Fire does not offer the full suite of apps available in the Android Marketplace. Google Music, which launched on Wednesday, can stream up to 20K songs and integrates with Google+. The Google Music app is available on all Android devices with OS 2.2+, but since Amazon customized the Gingerbread version of Android, the app is not compatible with the Kindle Fire. Kindle Fire users can still access Google Music in the Silk browser, but Spotify users are pretty much S.O.L. since Spotify is only an app. To access music on the Fire that you did not purchased from Amazon, you need to download Amazon's online storage tool Cloud Drive, which lets you store up to 5GB -- roughly 1K songs -- for free, and then upload your music to Cloud Drive. With 17 million songs in the Amazon MP3 Store, any music you purchase will be available on the Kindle Fire, Android devices, iPad, PC or Mac. Amazon also offers free storage on the Cloud Drive for anything purchased on the Kindle Fire. For a limited time, all Cloud Drive paid storage plans include unlimited space for music. The plans range from $20 per year for 20GB of storage to $1K per year for 1K GB of storage. Apple, on the other hand, offers cloud-based streaming and matching service iTunes Match for all Apple devices, but for $24.95 per year. Apple also offers iCloud to keep all your content and apps synced across all of your devices. While the Kindle Fire is intended for media consumption rather than productivity, it would still be nice to have Bluetooth for using a wireless keyboard, a 3G option so you can use it while commuting, and the ability to take screen shots. Considering that the Kindle Fire costs $199, compared to $499 for the iPad 2, we aren't too surprised it lacks certain features. But a real iPad killer would have to offer a more open ecosystem and still charge just $199. Google Music on the Silk browser.